This second issue of IJURR’s “Spotlight On” web series focuses on military urbanism and urban terrorism. What are the socio-material effects of the new urban geographies of war? In the years following the September 11, 2001 attacks, urban scholarship bean to theorize the geographical shift of military conflict towards cities, with various IJURR authors contributing to this conceptualization of urban warfare. Drawing on a range of urban cases and disciplinary perspectives, the contributions to this Spotlight provide an update and an extension of this work. These authors emphasize the need to develop new lenses to understand the working of new types of urban political violence and the offensive or defensive strategies they engender. Saskia Sassen suggests seeing cities as not only reactive sites responding to exogenous shifts, but as also playing an active role in reshaping the logic of geopolitics. Beyond the deleterious effects of asymmetric war on cities, she directs our attention towards the effect of the urban scale on the political logic of war – specifically, the limits of the ability of superior military power to “win” a conflict. Notwithstanding her concern about the diminishing capacity of the urban civic and commercial sphere to curb political conflict, she argues for an understanding of cities as “weak regimes” that can temper the imperial reach of militarily dominant nation-states. Miriam Greenberg proposes a very different type of conceptual shift. Drawing on a comparison of New York City and New Orleans, she suggests approaching urban terrorist attacks through the lens of “cities in crisis”, rather than that of war per se. This approach involves understanding terrorist attacks not so much as a sui generis phenomenon, but as a type of contingent, catastrophic event that can be compared usefully with the urban crises generated by natural disasters or financial meltdowns. This type of comparison highlights the similarities in the temporality and spatiality of the experiences of such urban crises, and the parallels in both regressive and progressive political responses. As the essays featured here draw our attention more directly to cities outside of the United States and Western Europe, this Spotlight also represents an initial attempt to globalize the debate on urban terrorism and warfare. As critical voices have noted, the limited international public and political response to “Beirut” and “Istanbul” contrasts sharply with the empathy expressed following “Paris”, “Brussels” and “Orlando”. A similar critique might be leveled at urban studies scholarship, which has had a strong concentration on a select number of cities. 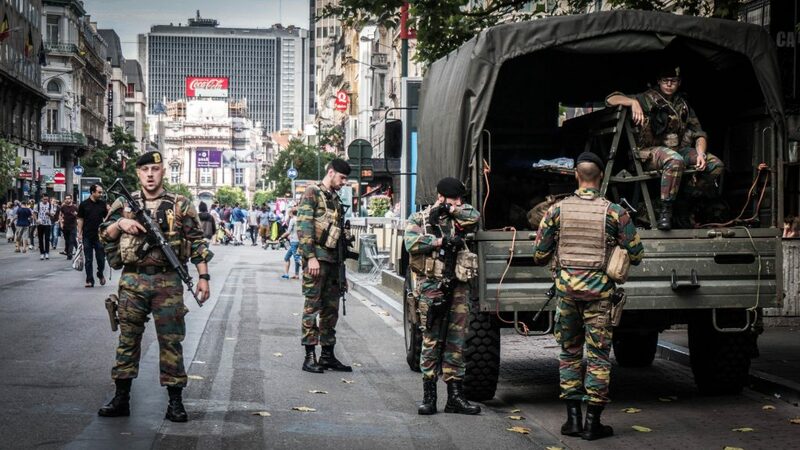 As Lior Volinz suggests, in his discussion of security responses and differentiated citizenship in Brussels and Jerusalem, we would do well to develop a more explicitly comparative approach to military urbanism, attending to local variations in the implementation and effects of an urban security logic. Another angle proposed by these essays is to shift our attention from more dramatic events and socio-spatial interventions, towards a range of less spectacular responses. Drawing on mainly European examples, Jon Coaffee’s essay outlines a shift in urban design responses to terrorist attacks, away from intentionally visible security barriers and towards more unobtrusive attempts to secure urban publics, that take the social and aesthetic impact of these interventions seriously. This shift in design strategies can be understood not only as a more sensitive mode of integrating security features into the urban landscape, but also as a response to the socio-spatial reorientation of terrorist attacks, which are now aimed less at high-profile financial and political targets and more at hard-to-protect “soft spaces” such as crowded markets or boulevards. In addition to this despectacularization of design, a sustained interest in less dramatic responses to urban warfare also directs us towards everyday urban life. As Mona Harb points out, there has been limited attention for urban residents’ everyday experiences of cities reshaped by the security imperative, or for the various socio-spatial responses they develop. Beyond the depressingly familiar defensive and repressive responses on the parts of political and economic elites, her discussion of residents’ initiatives in Beirut points to the possibilities for new forms of socio-political mobilization and urban politics to emerge in even the most dire circumstances. In addition to these five new position pieces, this Spotlight also features a number of articles previously published in IJURR, which have been made open access for three months. These include seminal pieces by Jon Coaffee, on the splintering effects of the incorporation of anti-terrorism strategies in urban design, and Stephen Graham, on the reworked urban imaginative geographies of war that constituted a new battlespace topology. We also include more recent scholarship, such as Kimberly Kinder’s article, which emphasizes that the militarization of urban landscapes results not only from the efforts of state agencies and major corporations, or from elites retreating to gated communities and other forms of defensive architecture. In addition, security self-provisioning by low-income urban residents also involves various forms of “guerilla-style” architectural interventions, albeit much less spectacular than the ones discussed most extensively in the urban literature. The “war” these residents experience also involves the violence associated with drugs crime and the structural violence of state disinvestment, rather than the political violence we usually associate with military urbanism. As these and other IJURR articles demonstrate, the journal has published a growing body of empirical and conceptual work on various forms of urban violence, their spatiality, and their political causes and consequences. This scholarship has also begun to explore how urban residents experience and respond to war and terrorism in their everyday lives. We hope that re-reading these previously published pieces along with our new essays will provide fresh insights and encourage debate on “the city at war” as both a political-spatial imaginary and a lived reality. Download this essay as PDF. These are open access essays under the terms of the Creative Commons Attribution-NonCommercial-NoDerivs License, which permits use and distribution in any medium, provided the original work is properly cited, the use is non-commercial and no modifications or adaptations are made.